Sometimes I write up recipes because they’re really easy. Sometimes I write up recipes that are good for the diet. This recipe fulfills neither of those requirements. But DAMN is it good. One thing I knew about Steve was that he loves to eat at Maggiano’s. For those of you who don’t have one of these Italian gob-stoppers near you, it’s like you would imagine dinner to be in The Godfather. Heavy American-Italian fare that is definitely off the charts on the Weight Watchers point counter. If you know anything about me, though, it’s that I’m all about eating good food in moderation. I decided I wanted to make meatballs for Steve. Living on the edge, I took the risk of also planning to use the meatballs in a baked ziti…even though I’d never really made meatballs and baked ziti before. Well, folks, I have to say it turned out great. So great, in fact, that I’m going to share the recipe with you here. You can actually use the meatballs and sauce on any pasta at all. You can also make them in advance and freeze them, so of course I always make double, which is nearly the same amount of work, yielding twice the food! I will show you the ingredients as a single recipe and you can double it if you please. Also, a quick note that my meatballs are inspired and informed by Marcella Hazan’s recipe from her amazing cookbook Essentials of Classic Italian Cooking. She uses all beef in her meatballs, but I have found I like the flavor added by hot sausage. Also, I have successfully mixed all different ground meats depending up on what I had on hand – this includes beef, pork, sausage, and turkey. You could also surely use veal, I just don’t happen to eat veal, myself. The last thing I should say is that this recipe turns out best if you drink red wine while cooking it. Just sayin’. Note: You can use any combination of meats here, but this is my ideal. Tear up the soft white bread (no crust) into little pieces and put it into the milk in a cup to soak for a few minutes. When it has absorbed much of the milk, mash it to a pulp with the fork and set aside. Be sure that, if you’re using poultry sausage, you have removed it from the casing. Combine all the meat in a bowl with the onion, parsley, egg, and cheese. Mix well. Squeeze the excess milk from the bread and add it to the meat mixture with a little salt and a few grindings of black pepper. Mix well. 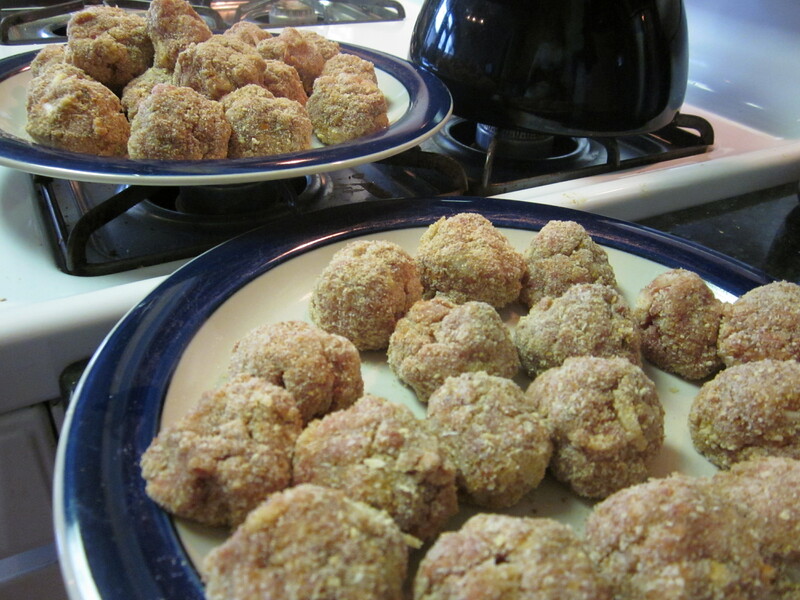 Shape the meat into balls about 1 inch in diameter, rolling each one on a plate of breadcrumbs until it is covered. Set aside. Choose a deep saute pan or a heavy-bottomed pot and fill to about 1/4 in. deep with olive oil. I realize this is a lot of olive oil to use, but you will need to keep some of it for the sauce, so I advise not cheaping out and going for vegetable oil instead. Bring the olive oil almost to a simmer. You’ll know it’s hot when you can flick a drop of water at it and hear a sizzle or a pop. 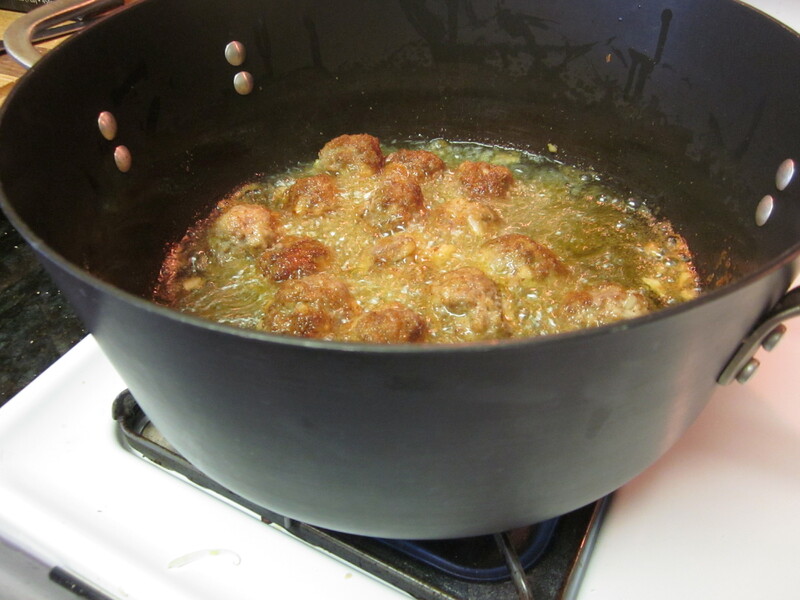 Gently lower the meatballs into the oil – if they don’t all fit, do it in batches. Let the meatballs sizzle away in there until they are brown below the oil line. Don’t disturb them too soon or they’ll fall apart! You went them to get a little crust on them. Not pretty, but you can see how it works. When they are sort of golden, gently dislodge them with a spatula and flip them over to make sure all sides are evenly browned. When they are golden, remove them and let them drain on a plate with a paper towel. Pour all but about 1/8 C of the oil out into a can or jar. You’ll be getting rid of this, but you don’t want to put it in your sink! The remaining oil and the browned bits on the pan will form part of your sauce. One 14oz. can of diced tomatoes (I like fire roasted, but you can also use Italian spiced or garlic flavored ones to your own taste). Pour all the sauce ingredients into the pot with the oil and stir. Bring to a simmer. 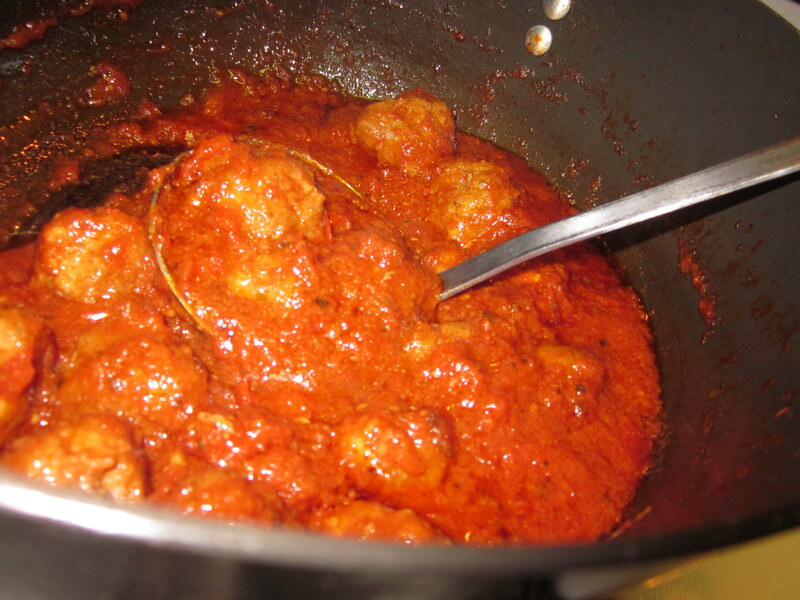 Gently put all the meatballs into the sauce and cover with a lid, leaving a vent for steam to escape. Let the meatballs gently simmer for about 25 minutes, stirring them carefully once or twice. At this point, your sauce and meatballs are done. You can serve them over any pasta or you can freeze them. If you want to make baked ziti, proceed to the next step! Prepare the ziti according to “al dente” instructions on the box. Drain. In a bowl, combine the ricotta and the shredded mozzarella cheese. Add a sprinkle of salt and pepper. Spread about 3/4C of sauce in the bottom of a 9×13 pyrex dish or similarly sized casserole dish. Pile in half of the cooked ziti. Using a rubber spatula, spread the ricotta mixture over the ziti. Pour in the other half of the pasta. Cover the entire dish with the remainder of the sauce. The result needn’t be precise – but you should have a dish full of pasta and well-coated in sauce. Cover the pasta dish in foil and cook in a preheated 350 degree oven for 30 minutes. While the pasta is cooking, thinly slice your fresh mozzarella. At 30 minutes, remove the foil from the ziti and place the slices of fresh mozzarella evenly over the ziti. Put it back in the oven and cook until the cheese is melted — about 7 to 10 minutes. I must say, we were pretty excited about how this ziti turned out. Steve professed to have enjoyed it, which is what any good guest would say. However, Dan couldn’t resist seconds, so I know I wasn’t the only one who really liked it. Quick and easy, it is not. Low calorie, it is not. But if you want a rich, Italian-American pasta dish with a wallop, I’m going to make you an offer you can’t refuse. Mangia! You’ll be head of “The Family” in no time. Ooh boy of boy, I can feel the calories climbing onto the hips and tummy already because this dish will have to be enjoyed with a second helping. Yep, you’re right. Wine DOES go with cheese! Looks yummy! They say that a good meal truly brings people together, in a way that goes beyond the obvious. The “life events” referred to are Mom being diagnosed with breast cancer in the same week our beloved maternal Grandmother passed away. We are grateful that Mom’s condition was detected very early, she has already had surgery, and pathology reports have come back negative for any remaining cancer. But it’s a terrifying episode to think your Mom might die, for the daily constants we take for granted to be so constant after all. As Mom began recovery, I decided I wanted to cook for the family. 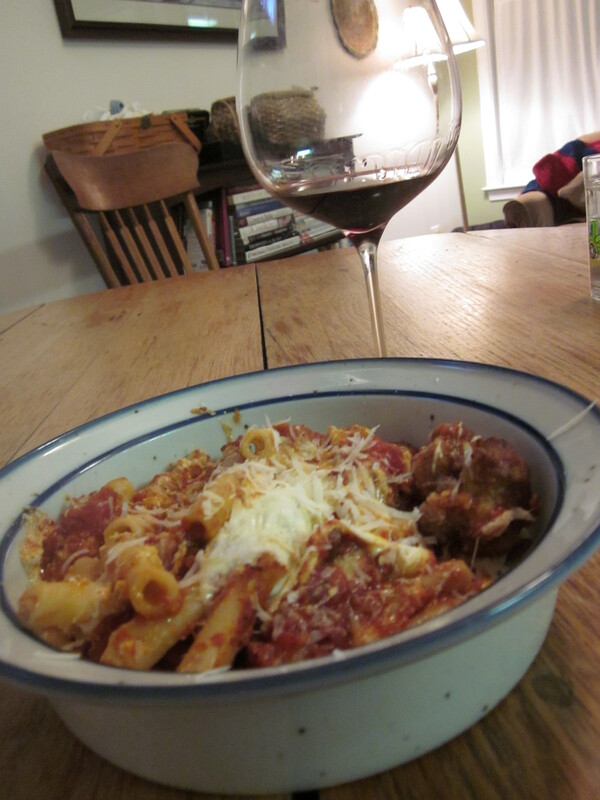 And the one and only recipe that immediately came to mind was Alicia’s “Godmother” ziti. Now, I am NOT a cook. My family warned that they’d probably eat something ahead of time. Alicia’s efforts in the kitchen exhausted me just watching it. But, I dunno, I just *wanted* to do this. Where Mom lives, the closest thing we have to any “gourmet” grocery store is Super Target. No Wegman’s or Whole Foods here. So I had to “make-do” in some cases. But even this non-cook was able to follow Alicia’s recipe, with a few frantic text messages to the chef herself for terminology I had never heard of, picture messages to confirm results, etc. Some specifics: As I said, my ill-at-ease nature with cooking had me following Alicia’s recipe very closely. Mostly due to Super Target limitations, I used only spicy Italian sausage and ground beef, no pork. For the can of diced tomatoes, Super Target had no such option as fire roasted, garlic or italian spiced, so plain it was. ST also had no “pecorino romano” (no idea what that even is! )so we used shaved parmesan. We didn’t need to add any oil to the meatballs to help them stick together, her recipe was just fine as-is, even minus the pork. Next time around, I would probably cut out the sausage, skip the ricotta, and perhaps use non-fat cheese in order to make it just a little healthier. My sister-in-law did a great job on spicing the sauce to taste, which is way more of an art than I would have expected! Everything turned out fantastically well, even to my surprise! Unbeknownst to me, the experience was a poignant memory for Mom because she remembered, as a little girl, watching her Mom make her own homemade meatballs! What could be more perfect than to remember our Moms in such a way! More immediately, my nephew is NOTORIOUSLY picky. I had doubled the recipe to give Mom leftovers, but my 13-year old nephew ate ELEVEN meatballs and FOUR servings of pasta (with even more meatballs – must be nice to be 13)!! My brother is also picky and had two full helpings. The six of us ended up eating a little more than half. It was one of those family mealtime experiences you often see on TV shows but rarely happens in real life. We bonded, we ate, we laughed, we celebrated life. It was exactly what we needed, and that is all thanks to Alicia’s recipe!